We feel that we are on the edge of a breakthrough in the Yucatan! 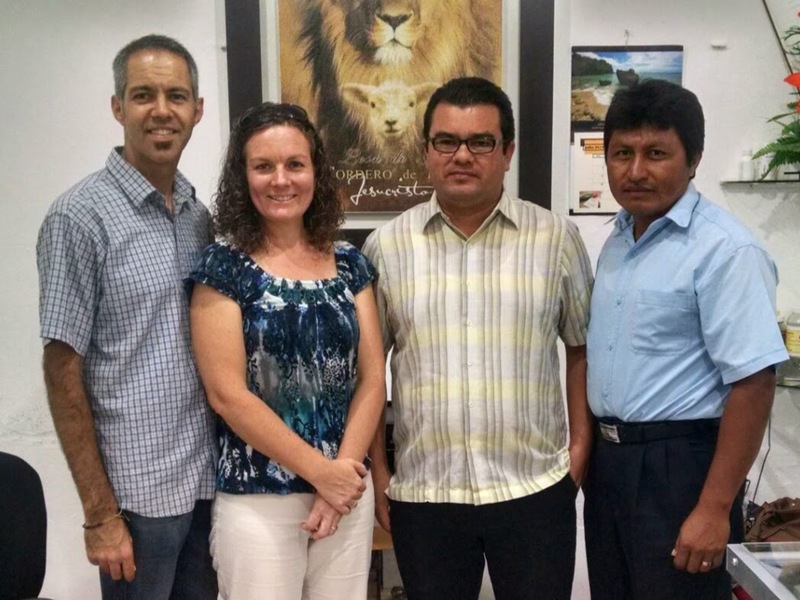 Standing with our partners (from left to right) Felipe Sabido and Leo May. Their dignity as a people group has been raised. Their access to faith-building resources in their own language has increased. Leadership has been named to conserve and extend these advances. We’re thankful for what has been accomplished, but we’re even more excited about the future, especially now that we see some key pieces falling into place regarding our vision of filling the Yucatan with churches. Partnering with then missions director, Felipe Sabido, we understood that carrying this vision to its fulfillment would require the establishment of training centers that would effectively mentor church planters through the process. To that end, we put in place a curriculum and outlined its basic structure prior to our departure from the field. What had escaped us, however, was a means by which our students could be awarded Bible school credit toward their credentialing process and diploma. We felt that this piece was essential. That enigma was solved last month as Felipe was named Bible school director for the next four years, streamlining our approval process greatly. We now see the potential to accelerate our start-up phase for training and more easily recruit workers to impact their communities. Still, this positive development has not come without consequences. Felipe’s movement into this new role leaves behind a missions department, the department charged with the carrying out of church planting, with a lack of experienced leadership. Leonardo May, the present director is a capable minister, but this appointment has thrust him into leadership of a department in which he has served less than a year, first as a regional representative, then as secretary-treasurer, and now as director. We hope that you can appreciate, then, the sense of excitement as we prime ourselves to take advantage of these opportunities, but, at the same time, urgency to return to serve as a support for those who are at the vanguard of bringing this vision to fruition. We desperately need to return on time and fully funded as soon as possible in order to stand with our ministry partners on the field. We need you to pray for us in this time of itineration that we would successfully increase our prayer support and meet our financial goals. If you’re not regularly praying for us, could you set aside a time in your week to lift up our lives and ministry? If you’re not a current financial partner, could you join our team? If you’re financially supporting us, could you share our vision with others that share your passion for reaching the lost? The clock is ticking. The deadline of July 2015 has been set. We know we must meet it. We know we cannot do it without you. Will you choose to strongly support us today?